This weekend, I watched 'Tracks', and besides recommending that everyone see it, I wanted to talk about the fascination these stories hold. Stories like Tracks, like Wild by Cheryl Strayed. These women walk on, stripped down, bare boned, independently braving the unknown. Is it because they aren't living in fear, or that they're rejecting society's expectations? That they're choosing to plunge into deep psychological introspection through grueling physical demands? The fascination of the hermit paired with the rejection of gender norms? It's the wild woman/high priestess archetype via popular culture. 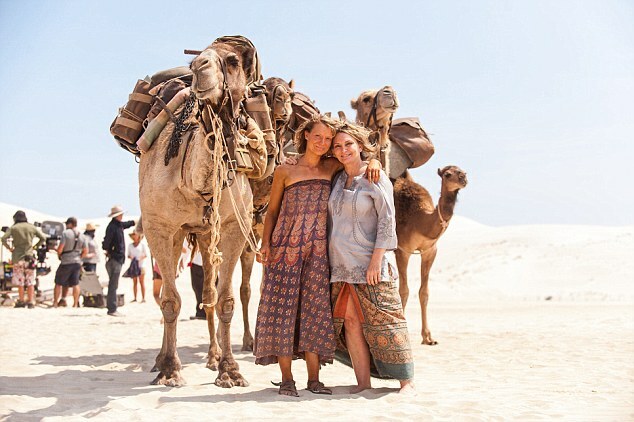 Tracks (based on the memoir by Robyn Davidson of the same name), is the story of an Australian woman who, in 1977, walked 1700 miles across western Australia, from Alice Springs to the Indian Ocean, with only four camels and her dog. It also shows her relationship with Rick Smolan, a National Geographic photographer. Rick joined her occasionally to photograph her for the magazine, which she grudgingly allowed to sponsor her. The photographs and attending article (which she wrote) were published in the May 1978 edition, and were wildly popular. The film and the memoir share the challenges, excitement, stress and solitude she encountered on the way, as well as the realizations she came to while walking. Robyn and Cheryl Strayed's refusal to give into fear has huge appeal for me. Mostly because I can be so afraid. Every time I come home alone to an empty house, I do a 'sweep'. I leave my shoes on, and go to room to room, (ESPECIALLY behind the shower curtain) checking to see if 'someone is hiding'. But seriously? Why. Even right now. There's definitely some kind of animal in my ceiling, and I keep jumping and having little heart palpitations with each noise I hear. Even thought I KNOW it's just a critter. There is a not a man hiding in my water heater closet with a knife. I know that I'm probably not the only woman (or just regular person) who feels like this and does this home check. But why do I feel this compulsion and fear? How wonderful it would feel to let go of those fears. Granted, both Tracks and Wild feature blond, educated, white women, women who have the luxury of rejecting cultural fear and gender norms without the threat of reprisal or censure. In fact, there are hundreds of modern nomadic cultures where journeys of this kind (hundreds or even thousands of miles on foot or with pack animals) are standard and normalized. We don't make movies about Tuareg women, and Oprah doesn't recommend books about Romani women. There's a well of legitimate critique of these journeys being cultural appropriation. Excitingly, Tracks was aware of its roots in the Aboriginal walkabout, as the filmmakers honored Robyn Davidson's intentions. A cultural and feminist activist, Robyn writes passionately about advocacy for Australian Aboriginals. The movie shows this advocacy, as when Rick Smolan is shown to invade a secret death ritual to surreptitiously take photos, we're invited to judge his inappropriateness, and Robyn's stilted (and at times romantic) relationship with Rick is sharply contrasted with her easy and peaceful time spent with Mister Eddie, the Aboriginal elder Robyn walks with for a stretch. "I liked myself this way, it was such a relief to be free of disguises and prettiness and attractiveness. Above all that horrible, false, debilitating attractiveness that women hide behind. I puled my hat down over my ears so that they stuck out beneath it. 'I must remember this whn I get back. I must not fall into that trap again.' I must let people see me as I am. Like this? Yes, why not like this." "“I got in huge trouble with the Geographic because you weren’t supposed to develop your own film,” he continued. “But one of the challenges was that she didn’t wear clothes a lot and I didn’t want to send pictures of her naked.”"
"“I used to develop the film myself in Sydney or Melbourne to show her. And the more beautiful I made her look the more she hated them,” Smolan says. “You made me look like a goddamn model,” she told him." But beyond the rejection of beauty norms, I think we're drawn to these stories of women alone on journeys of the spirit, because traditionally, it's men. The Native American spirit walk, the 30 days in the Sinai desert, Chris McCandless, the Aboriginal walkabout, all men. Even the Appalachian Trail Convservancy, the preservation and management body for the Appalachian Trail (a relatively accessible 2,000 mile walk along the spine of the Appalachian Mountains from Georgia to Maine) says that only 25% of their finishing 'thru hikers' are women. Long-distance, solo female travel is rare enough that organizations exist to facilitate and help women in their journeys: She's Wanderful says "The power of the Wanderful network is in our ability to bring women travelers together around the world and to create a space where we can help each other travel confidently, safely, and passionately (and to have an outstanding time while doing it)." Organizations like this don't really exist for men, because there isn't a need for it. Granted, men, too, sometimes seek out extreme environments in response to psychic wounds, in life as well as in literature. But for them, the wound is optional; men are free to undertake an adventure without needing trauma (or anything else) to legitimize it. By contrast, a woman’s decision to detach herself from conventional society always requires justification. Women can, of course, go out exploring for pleasure or work or intellectual curiosity or the good of humanity or just for the hell of it — but we can’t count to ten before someone asks if we miss our family, or accuses us of abandoning our domestic obligations. In Tracks, as in Wild, the women dramatically forgo those domestic obligations. Siblings, parents, friends, are all left behind as they strike out on their own. They become the Wild Woman and the High Priestess; archetypes of instinct, ferocity, and introspection. Qualities that I strive to embody and that lie at the heart of empowerment. To trust yourself deeply, to have confidence in your own strength and protect those that depend upon you, and to dive deep into your own heart and spirit. To truly know yourself and have the power to back up your knowledge. These are the tenets of empowerment, and these are what I hope to bring at least a little of, to each woman who attends one of my events. Know yourself, trust yourself, love yourself. These are the dreams of my heart. So feel your boldness, reject the need for 'pretty', and strike out on your own road. I can't wait to see which path you end up taking.